In 1956, Orlando was the growing center of a citrus industry. In September of that year the Baltimore based Glenn L. Martin Company announced that it had bought nearly 12 square miles of land southwest of Orlando to build their new Orlando Division. Roads, utilities and water lines, housing – all construction kicked into high gear to accommodate the new defense production facility and the influx of some 2,700 employees and their families. 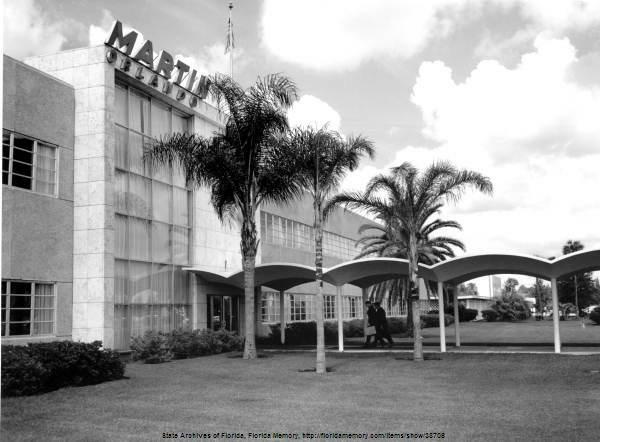 On Dec. 4, 1957 the Orlando Division plant of the renamed Martin Company opened its doors, and production began on missile projects such as Pershing, Bullpup, Lacrosse, Sprint, Patriot and Hellfire. Due to a merger the Martin Company became Martin Marietta in 1961 and another merger led to a new name in 1995 – Lockheed Martin. Orlando became, literally, the crossroads of the state with Interstate 4 and the state turnpike intersecting just south of the city due to the company’s influence in the turnpike’s planning phase. Then the Bee Line (now the Beech Line) expressway to the east coast was constructed to facilitate quick trips to the Space Coast by Martin employees as well as commuters to the growing space industry. The company (by whichever name you know it by) and its thousands of employees were and continue to be a major contributor to the success of this community and we wish to share their memories here. Please bring other’s to our attention so that we many include them. Please see our contact page. Feel free to ask us for assistance! Photo of the new Martin Company plant on Sand Lake Road completed in January 1958.